Should we panic? Perhaps…but not because of this jobs report. Today was a fascinating exercise in data collection and analysis. There is absolutely no reason to go into most of the actual numbers this month, but we have to go through the positives and negatives because, taken at face value, this report is awesome! In fact, if we were to be given the detail in advance and asked to predict job growth based on them, we’d have projected between 200k and 225k. The Labor Force, Total Employed, Participation Rate, and Employed-Population Ratio all grew by very healthy margins. The Unemployment Rate, Total Unemployed, and Not in Labor Force totals all fell…by very healthy margins! The bad news was all in the headlines. Is there an explanation? Yup. The obvious answer is the active hurricane season. But how does that throw this report into chaos? One example, without going too deep into the weeds, the report data is acquired from two different surveys, Household, which surveys individuals, and Establishment, which surveys employers. This is an unusual circumstance in that one who is counted as employed by one survey is counted as unemployed in the other based on whether they got paid. As we might suspect, the hospitality industry took it on the chin, so a lot of folks with “jobs” didn’t end up working and didn’t get “paid.” A major data point we were waiting to see was the response rate. We can get significant revisions to the jobs report over the two months following each release as many send their survey responses late. This month we fully expected the timely response rate to be way down. It wasn’t. According to the BLS, response rates were within normal limits in and out of the hurricane affected regions. So…pay no attention to the details behind the curtain EXCEPT the revisions. The only meaningful data point to come out of this report is the net -38k revisions to July and August. That brings the three-month headline down to a 91k average for Q3 2017. That is simply not good enough. At writing, S&P futures are trending down, but there is no indication of a gap-down vertical graph, so it seems the markets will take this in stride understanding the temporary nature of a report that will undoubtedly revise between now and year end. 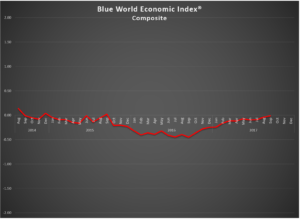 For more on the overall state of the economy you’re invited to review the Blue World Economic Index® Report for September which posted earlier this week. We’ll have no choice but to downgrade the index value for this report under the Employment category, but it won’t be as severe as the numbers imply for all the anomalous reasons listed above. Have a great and safe Halloween, and we’ll meet back here for the next Employment Situation release, which is scheduled for Friday, November 3. The economy’s flirtation with a positive reading is as tantalizing as a butter-seared, blood-rare Porterhouse, wild rice and a snifter of cognac is to me on a Saturday night! TMI? Apologies. The Blue World Economic Index® made a solid move from -.4 to -.1 for the month of September 2017. 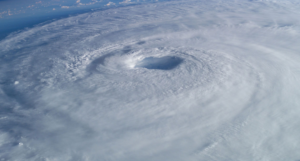 It must be noted that looking at a lot of the reports would suggest bigger changes from last month in either direction, but we exercised a bit more restraint due to the awareness of the continued but temporary impact of the active hurricane season. There was also a material impact from short and long-term trend upgrades in GDP from -1 to -.5 because the trends are weighted more heavily than the current month’s report. That said, we expected worse from the hurricanes, especially in reports that post in the second half of the month, and the consumer appears to have already gotten over it. Below we’ll talk about weakness in Real Estate, but there is a lot of thinking out there that the weakness represents a short-term rebalancing and may be a harbinger of better things to come later next year. The Chicago Fed has been the only contrarian in the Fed sub-group two months in a row, which is a bit perplexing and concerning since that report is uniquely national in scope rather than regional like the others we follow for that group, and the regionals are knocking the cover off the ball. December Fed meeting, you ask? The late entries of Personal Income and Outlays, Farm Prices, and GDP Inflation coupled with the mid-month reports of Producer Price Index-Final Demand and the Consumer Price Index all suggest inflation still resides in the where-are-they-now-file, but there are, as we’ve said, some other positives. We think there are arguments for the doves and hawks, but we are taking the under this month and saying we’ve seen the last of the hikes for 2017. Of the eight major categories, five are still above water. They are Consumer, General, Manufacturing, Real Estate, and Retail. Of those, all but one, Real Estate, posted gains since last month, but recall some of the conflicting signals in Retail where negative scores for Motor Vehicle Sales and Retail Sales were cancelled out by equal and opposite scores in Business Inventories and E-Retail, leaving the notoriously contrarian Red Book report to carry the ball. Manufacturing continues to excite with the Fed AND non-Fed groups advancing .03. Employment and Inflation are still underwater, where Employment slipped fractionally, but Inflation, while improved .11, is still solidly negative at -.37. Services remained unchanged at -.16. We’ll see what else the hurricanes have to offer the fourth quarter, and with high stakes policy issues like tax reform coming up we see volatility and excitement from street level to Wall Street on tap! The Blue World Jobs Report Analysis will post on Friday. Have a great October, a wonderful Halloween and we’ll see you back here at the opening of November.